cmsmcq.com is the personal Web site of C. M. Sperberg-McQueen. I use it to host various material that doesn't have a better place to live elsewhere. Opinions expressed are mine (mostly) and should not be confused with the official views, if any, of my employers, clients, patrons, friends, colleagues, or assorted hangers-on. Visiting professor, Program in Digital Humanities, Dept. of Linguistics and Literary Studies, Technical University of Darmstadt (Institut für Sprach- und Literaturwissenschaft, Technische Universität Darmstadt) summer semester (April - July) 2015 (my TU home page). Co-chair of Balisage: The Markup Conference (every August in Montréal). Invited expert in the W3C XML Schema Working Group, co-editor of the XSD 1.1 spec. Invited expert in the XSL Working Group. I have a blog called Messages in a bottle. It's mostly about markup, with digressions to other things on my mind. 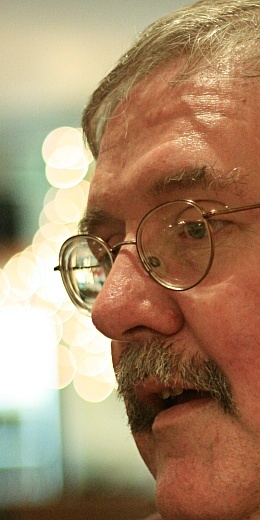 A member of the technical staff at the World Wide Web Consortium from 1998 to 2009. While at W3C, I filled several roles: member and later chair of the W3C XML Coordination Group; Member and staff contact of the W3C XML Schema Working Group and co-editor of the XSD 1.1 specification; Member and staff contact of the XSL Working Group; Member and staff contact of the Service Modeling Language (SML) Working Group; member and alternate staff contact of the XML Processing Model Working Group; member and alternate staff contact of the XML Query Working Group. I served as the leader of the W3C's Architecture Domain from July 2001 to September 2003, before escaping back to technical work. Administratively, I was attached to the MIT host site and was thus an employee of the MIT Computer Science and Artificial Intelligence Laboratory. Co-editor, Extensible Markup Language (XML) 1.0 spec (1998). Co-editor, with Lou Burnard, of the Text Encoding Initiative's Guidelines for Electronic Text Encoding and Interchange (1994). Co-chair from 2000 through 2006 of the annual conference Extreme Markup Languages (before helping to form the new Balisage conference). Served as Editor in chief of the Text Encoding Initiative, an international cooperative project to develop and disseminate guidelines for the encoding and interchange of electronic text for research (1988-2000). Ph.D. in Comparative Literature, Stanford University (1985). Email: cmsmcq@blackmesatech.com, Post: 259 State Road 399, Española, New Mexico 87532-3170. Tel: +1 (505) 747-4224. N.B. I filter my email using a white list, so if you have not written me before your email will go into a folder for unknown senders rather than into my in box. I check the holding tank periodically, but (a) it does slow down delivery of mail from unknown addresses at the best of times, and (b) since about 99.5% of the mail in the holding tank is junk, I scan the subject lines of mail caught in the filter rather fast, so it's possible that I may miss a legitimate message if its subject line looks like one spammers use. So if you write me out of the blue, using an informative subject line is a good idea. I take this opportunity to note that since my name and email address are publicly available, they are routinely forged by mailers of spam and viruses. I apologize if you receive virus-laden email purporting to be from me, but it almost certainly isn't really from me.